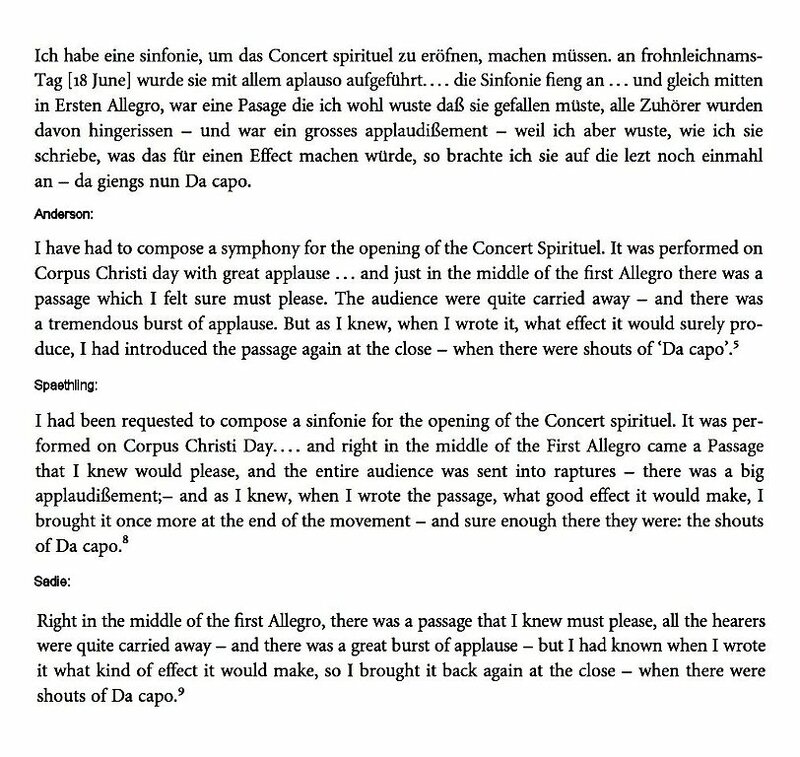 In his article "The 'Effective Passage' in Mozart's 'Paris' Symphony" (Eighteenth-Century Music, 9/2012) Matthias Range deals with the meaning of the words "mitten" and "auf die lezt" in Mozart's letter of 3 July 1778 and their translation by Emily Anderson, Robert Spaethling and Stanley Sadie. But the real blooper in all three published translations of this letter goes completely unnoticed. Like in countless other cases, Emily Anderson, with her persuasive mistranslation, was able to completely convince her male successors. Her nonsensical "There were shouts of 'Da capo'" duly lead to Spaethling's "There they were: the shouts of Da capo" and Sadie's "When there were shouts of Da capo". I brought it once again at the end of the movement – and there they went again. The fact that there is still no reliable and scholarly annotated translation of the Mozart family letters is still a major impediment for Mozart scholarship. W.A. Mozart, Correspondance II 1777-1778, Paris : Flammarion (Harmoniques), 1987, pp. 336-337. Nice. But Mozart's use of "Da capo" is no joke. It's the regular use of the term. I know what Da Capo means, but I misunderstood it as a reference to the "grand applaudissements" which came back "Da Capo"... as did the Pasage. So, with the word "cela" Mozart meant the return of the musical theme and not the audience pleasure in hearing it. Thanks. By the way, is the custom of applause/clapping documented? I always wondered when and where it first began.